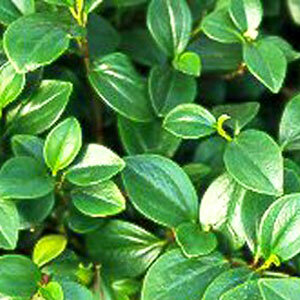 Peperomia (also called Baby Rubber Plant) are herbaceous perennials native to Mexico and South America. While they bloom seasonally, they are grown for their distinct foliage and ease of care as a houseplant or ground cover in warmer climates. Use Peperomia as a cascading evergreen in your combination planters and hanging baskets, or in a small container as an indoor houseplant. Zones 10-12 can produce this plant for landscape use for shade areas. For best results with Peperomia, we recommend using a constant feed program of 150-200 ppm N. Maintain a pH between 5.8 - 6.2. Grow in an area of high humidity with no direct sun. Pinching is recommended 5-10 days after transplantation. Additional pinches and trimming will be necessary to shape the pot. Hanging baskets should be spaced 18-24 inches. Space adequately to allow airflow and light penetration between the foliage of adjacent pots. Mealybugs, spider mites and whiteflies are the biggest pest problems with Peperomia. Glabella are not prone to many diseases, but watch for botrytis while the days are short. This grey rot is usually associated with wet or humid conditions. You can prevent botrytis by allowing the plant to dry out between waterings, allowing for good airflow in your greenhouse, and spacing to allow the sun to penetrate to the soil level. The most common chemicals used to treat botrytis are Medallion and Banrot. Use them as a drench according to each label’s instructions. We recommend planting 5 starter plants per 10 inch basket. Use a well-drained soil in your baskets and plant your starter plants deep, allowing the ellepot to be completely covered by the soil. If you are planting 4” pots, 3 plants per pot should be sufficient if you have enough time. Plant them in a triangle in the middle of your pot.